With these 266 beds, it is the largest hostel in Canada. Offering private room accommodation as well as shared room, you will find the option that suits your needs. The hostel will charm you with his ancestral buildings and therefore, all the rooms are different from each other and all have a unique charm to discover. Couldn't have enjoyed my stay more. I can't say enough good things about the staff, they all deserve a raise. I will only stay here when I visit Quebec! 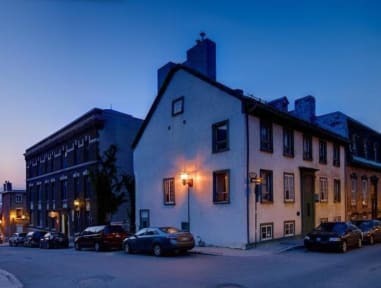 PERFECT location in Old Quebec City. It was close to everything, including an ice skating rink. It was also very clean and was a great place to stay during our trip. Had a great stay with comfy beds and a warm room during the cold winter. Facilities were clean with hot showers. Breakfast I thought was expensive for all of it being carbs. Hostel bar also closes early too even on the weekends but I would rather go out to the bars in the city anyways. We stayed in a private room in the hostel, which was nice. The shared bathrooms were extremely clean which was great. The location of the hostel is perfect as it is in walking distance of everything. One suggestion would be to highlight the noticeboards to guests on checkin as we missed out on some of the daily tour options/hostel activities as we didn’t see the board. Overall a nice stay. The staff where very friendly and accommodating. The hostel has great facilities and it is very spacious. They offer daily tours and I was able to learn about the hostel’s interesting history. It location in old Quebec makes it easy to visit all of the tourist spots, it is also only a 13 minute walk from the train station. It’s a cool place that is well located and worth it. The facility is quite outdated and breakfast is lacking variety. 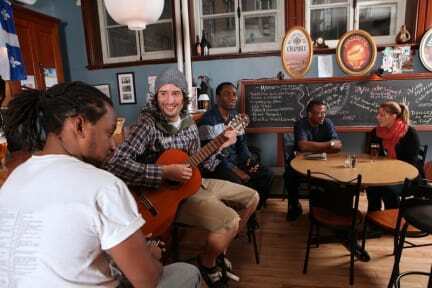 With that being said, I recommend this hostel in Quebec City! Overall, great experience. The staff member, Florence, was a joy to speak to and gave me good recommendations. I also made an awesome new friend from one of the morning tours the hostel offers. Just be prepared to climb a hill! Merci beaucoup pour l’expérience. Good location, very clean, lots of common areas. Beware of MANY conference groups staying here. One day, I tried to find a quiet spot to write an email and there was LITERALLY a dancing class stomping over my head. Much louder than I hoped. Also, mattress, pillow, and blanket are very thin, so you may consider bringing back up. Generally a good hostel. Close to the train station but beware, the walk is all uphill!! Good happy hour at the bar. Would have liked a few more shared bathrooms and showers on each floor. Friendly and helpful staff.